2018 Aki Basho banzuke released. Discussion in 'Sports' started by Swami, Aug 27, 2018. Georgian Tochinoshin will face his first threat to survival as an ozeki starting on Sept. 9, when the Autumn Grand Sumo Tournament kicks off. The 30-year-old failed to win eight bouts in July, his first tournament as an ozeki. He won five of his first seven matches but injured his right big toe and was forced to sit out the final eight days in Nagoya. Placed at the bottom of the ozeki trio in the latest rankings published Monday by the Japan Sumo Association, Tochinoshin is now a "kadoban" ozeki and will need a minimum of eight wins over the 15 days at Tokyo's Ryogoku Kokugikan if he is to fight at sumo's second-highest rank in September. Tochinoshin is the first ozeki to be threatened with relegation in his second tournament in 18 years. His two senior ozeki colleagues, Goeido and Takayasu, were in Tochinoshin's shoes in July in Nagoya but ended with 10-5 and 9-6 records, respectively. Sitting atop sumo's mountain as the lead yokozuna on the prestigious east side of the rankings is Kakuryu. The 33-year-old Mongolian won back-to-back tournaments in March and May before injuring his right elbow and sitting out nine bouts in July. Fellow Mongolian Hakuho, looking to add to the record 40th championship he won last November, sits atop the west side after missing 11 bouts in July. Yokozuna Kisenosato, who has not competed since January, appears to be fit for the first time since March 2017. That was when he fought through chest and arm injuries to win his yokozuna debut. "Once more I want to gather all my strength and determination," Kisenosato said. "The key is being able to perform in peak condition. I want to do my utmost until the tournament's final day." For the second straight tournament, Mitakeumi and Mongolian Ichinojo will fight as sekiwake. 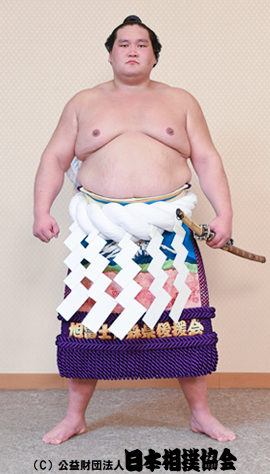 Mitakeumi will be spending his 10th straight tournament among the "sanyaku" ranks, the three tiers below yokozuna. September's tournament also marks the makuuchi division return of Mongolian Takanoiwa. The 28-year-old will be fighting as the east's No. 13 megashira after a 13-2 July campaign in the second-tier juryo division. He had slipped down the rankings after suffering a concussion at the hands of former yokozuna Harumafuji during a drinking session last October. Two other wrestlers have been promoted from the juryo division. Kotoyuki returns for the first time since March and will fight as a No. 16 maegashira. Making his first appearance in sumo's top flight will be 23-year-old Takanosho, who will debut at No. 14. Great update. I was eager to see the Aki Basho listing. I'm just hopeful Kisenosato competes for the full tourney. Sad to hear that Tochinoshin is a kadoban ozeki. I hope he gets his eight wins. Of course I was curious and at Maegashira #15 is Yoshikaze. He now needs to get some wins in September. Tochinoshin should be OK. Like you, I hope Kisenosato gets through OK as well. Reports suggest Kisenosato seems to be in good shape. For the first time in his career, Tochinoshin is Ozeki Kadoban. The previous were Goeido and Takayasu. Mitakeumi stays Sekiwake and is in Sanyaku for the 10th tournament in a row. Ichinojo remains at the Sekiwake - rank for the third, in Sanyaku for the fourth consecutive tournament. Tamawashi stays in the Komosubi-rank as well as in Sanyaku for the second consecutive tournament. Takakeisho returns to Komusubi, the rank he previously held in January of this year after 4 tournaments. Takanosho is the first Rikishi from Chiganoura Beya to reach Makuuchi since the current Shisho has inherited it on 8th of April 2016. He follows Masunoyama from the same stable who was promoted in September 2011. Takanosho is the 22nd Rikishi post WWII from Chiba Prefecture to achieve this. The previous one had been Asahisho in the September tournament in 2012. Takanoiwa returns to Makuuchi after 5 tournamnt, he had previously been there in the November tournament of 2017. Kotoyuki returns to Makuuchi, the rank he previously held in March of this year, after 3 tournaments. Hakuyozan returns to Juryo after 2 tournaments. Enho returns to to Juryo, the rank he previously held in March of this year, after 3 tournaments. Jokoryu returns to Juryo, a rank he previously held in May 2016, after 14 tournaments. Since Juryo became a rank in January 1888, it has never happened yet that a Rikishi with Sanyaku-experience who had fallen down the ranks as far as Sandanme has returned to Juryo. Akua returns to Juryo, the rank he previously held in January of this year, after 4 tournaments. I read Terunofuji has knee surgery in June. I still cannot believe that he hasn't quit yet, it is absolutely humiliating for a former ozeki to fall so low. I'll be eager to see if all three yokozuna and all three ozeki make it to day 15. That in itself would be something, but no doubt overly hopefully. The pressure is sure on Kisenosato. I still think you could see Hakuho retire before the end of the year.